CON-TROL-CURE® REMOVABLE VINYL UV FILTER SHEETS can be used on any inside window surface to prevent UV radiation from causing premature curing of your UV inks or coatings. The vinyl uv filters are effective to reduce high visible light levels as well as to filter UV Light. As well as to significantly reduce the amount of glare, fading, and excess heat associated with ultraviolet rays. 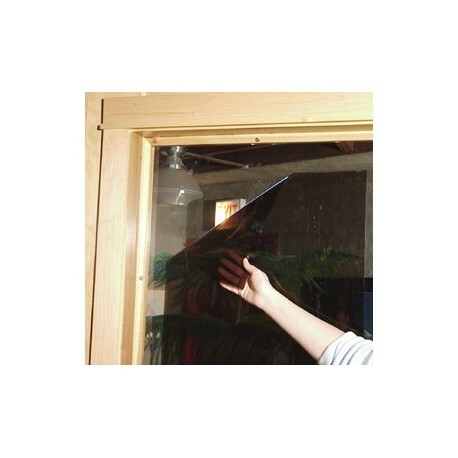 These patented 8-gauge REMOVABLE VINYLE UV FILTER SHEETS for windows offer 98% UV radiation protection, 90% visible light protection, and 51% infrared radiation protection. Installation is easy. Simply wet one side of the sheet and apply with sponge or squeegee to any inside window surface. This material is available in 36" width cut to specified lengths, or in uncut rolls. Brown in color.